Other names: Aaron's Rod, Ayegreen, Ayron, Bullock's Eye, Hen-and-chiks, Jupiter’s Beard, Liveforever, Sengreen, Thor's Beard, Thunder Plant. Habitat: Houseleek originates from Europe. It grows on sunny rocks and slopes, old walls, roofs and chimneys. 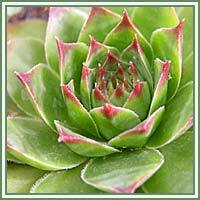 Description: Houseleek is perennial, succulent plant. Grows closely to the ground (0, 2 meters high). It has a basal rosette of thick, fleshy leaves. From the centre of the rosette grows a hairy stem, with pink, star-shaped flowers. The plant is in flower from June to July. Useful components: Mucilage, malic acid, tannins, and resins. 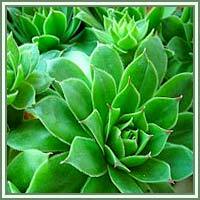 Medicinal use: Houseleek is considered to be an astringent, diuretic, odontalcic and vulnerary. Externally, the plant is used for a variety of skin conditions. Houseleek juice and poultice have an astringent and soothing effect on the skin, thus being helpful in cases of burns, bites, scalds and strings. Internally, houseleek is used for treatment of shingles and hemorrhoids (in these cases the plant should be used carefully, because it also has an emetic and purgative effect). Houseleek juice is also used for ear pain (otalgia).